Orb of Vaermina is a unique legendary Neutral support card. It is part of the Core Set. In addition to the card's availability in the Core Set, one copy is obtainable as a potential reward from Interlude. If rewarded, it will be added to the Band of Survivors, Black Marsh Smugglers, Dunmer Avengers, and Imperial Might decks. 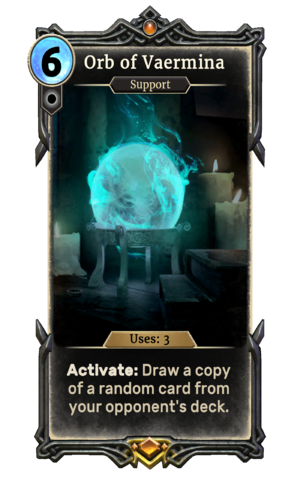 The card is named for the Daedric Prince Vaermina.